Our crisp vanilla fortune cookie is hand decorated with Dark chocolate lovers in mind and contains your personalized custom message inside. Makes a perfect gift or snack for yourself. 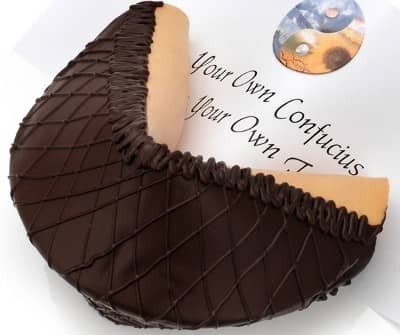 Our Dark Chocolate Lovers Giant Gourmet Fortune Cookie is the perfect gift and greeting all in one. Our confectionery artisans start with an enormous vanilla fortune cookie baked to order and hand dip it in decadent deep Dark Belgian Chocolate. Each cookie is finished with an expert hand drizzle of Dark Chocolate for an elaborate and artistic presentation. Each cookie is wrapped in a cello bag and finished with a satin bow. Our cookies are gift boxed with tissue paper and hand packed in our glossy white gift boxes. Your personalized message goes on the 1-ft-long fortune inside each cookie for an unforgettable and unique gift. Giant cookie measures approximately 6.5" x 6" x 6"